Shower systems are streamlining the installation of showers and steam showers with a range of developments such as: curbless/barrier-free systems for accessibility, flexibility and style; pre-formed components for speed of installation and shower integrity; fool-proof waterproofing and aesthetic advances like linear and wall drains. While a fashion statement, curbless showers also offer practical advantages for disabled or aging populations. 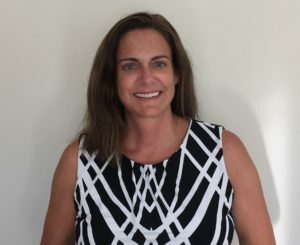 Ketterer said that according to the Administration on Aging, “For the next 18 years, baby-boomers will be turning 65 at a rate of 10,000 per day. Of these, 79% report the ability to age-in-place and live independently as their main concern.” The availability of “new and innovative curbless shower systems that require no structural modifications to the floor joists as was required in the past can meet everyone’s needs by offering style, accessibility and unlimited design options at every stage of life,” Ketterer said. Barrier-free showers are continuing as not only a trend for an aging population but a fashion statement and design element. Having the ability to build a barrier-free shower in any configuration is most popular. The marriage of traditional methods and new technology continues its push into the market. This is being driven by the building code that recently reiterated that joists are not to be modified more than 1/4” unless a structural engineer is consulted. A contractor assumes the structural liability if they compromise the joist structure without engineering consultation. In many homes that were built with engineered joists in the 2000s, the addition of a barrier-free shower or even traditional mud pan was prohibited by the engineered joist. 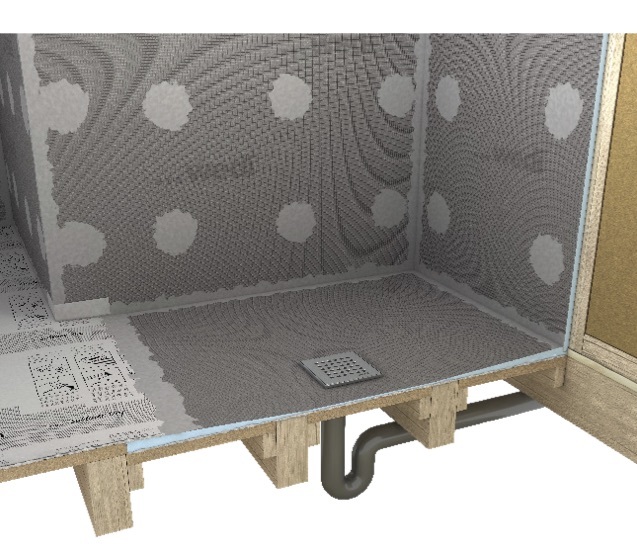 New methods have made installation of shower products possible in engineered joist construction. Luxurious bathrooms have been a residential trend, but now owners of larger multi-unit buildings are also demanding custom-looking showers. Spa-like bathrooms have recently become more prominent in institutional, healthcare, resort, spa and pool facilities. Owners of commercial and residential spaces rely on the contractor to help them create these spa-like sanctuaries. These rooms have to blend form and function, combining a shower’s necessary utility with the look and feel of a spa. However, in order to keep profits up, contractors need to work efficiently – particularly on multi-unit jobs. Preformed products – like niches, shower seats and curbs – help contractors meet the demands of this design trend. Preformed components are consistent and easy to install – great for fast multi-unit installations. Look for preformed components that integrate seamlessly with existing surface prep solutions, mortar, tile and grout. For protection against mold and mildew, choose a product that comes coated with an IAPMO- approved, waterproof membrane that meets ANSI A118.10. Preformed components are a great way for tile installers to add a design element that fits with today’s building trends. 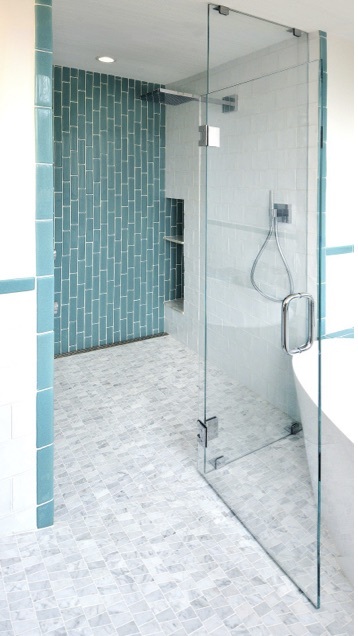 Barrier-free shower installations are gaining popularity for their clean-looking tile lines and zero-entry profiles. In order to properly execute these installations without the benefit of a traditional curb placed at the shower entry, high-tech installation materials and drains can be used. 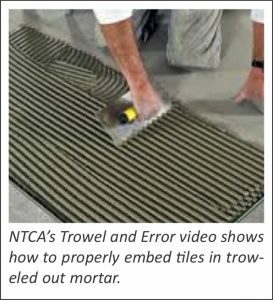 Possibly the best current installation methods/options for barrier-free shower applications are the Tile Council of North America’s (TCNA) B-422-14 method or a modified version of B-415-14. 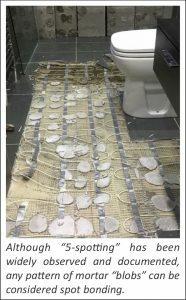 This installation method provides a complete waterproof connection between the waterproofing membrane and the drain placed at the surface of the tile installation – which minimizes the height of the overall installation. Therefore, there is no need for the full, bulky 1-1/4” to 2” (31mm to 50mm) thick mortar bed and curb that are required in traditional shower pan installations. 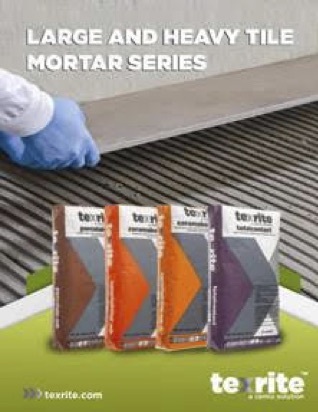 This barrier-free installation type places the waterproofing membrane underneath the tile or stone finish versus the bottom of the mortar bed in traditional shower-pan applications. These methods allow water to shed right at the surface through an integrated bonding flange type drain system or a linear drain with a bonding lip, which receives the waterproofing membrane. The slope in the shower assembly can be started from a much lower profile while still maintaining a 1/4” per foot (6mm per 300mm) slope. These assemblies provide a dramatic improvement when compared to the traditional, bulky, thick-bed mortar installation systems. In response to a rapidly escalating growth in demand, several companies have introduced linear drains. These drains have been popular in Europe for years because they complement contemporary and barrier-free designs. The single slope created with a linear drain allows for the use of large format tiles that are ideal for contemporary, barrier-free showers favored by designers. A number of linear drains are available. Some are systems that include waterproofing membranes. Other manufacturers offer only the drain and suggest options for waterproofing. Does it assure a secure, watertight connection between the waterproofing membrane and the drain? Does it offer the aesthetics desired? Because in the end, the strainer is all you will see. 4. Integration with shower-pan accessories and waterproofing for speed and ease of installation. 5. A new trend is moving the drain into the wall instead of floor. Shower systems/drain systems seem to be popular with architects in hotels now and I imagine the trend will continue to grow. These shower systems come complete with pre-sloped shower pans, pre-formed curbs, waterproofing membrane, corners, seam rolls, etc. These are now being specified because they are a more efficient/effective method than the traditional way that entailed building the curb out of bricks, etc. However, it’s still necessary to have skilled tradespeople who have been trained to install these systems. Problems can still occur and skilled tradespeople best know how to address them. For example, the assumption is that since you simply install the pre-slope onto the substrate, and because the pre-slope already has a pitch of 1/8” per foot to the drain, you will have guaranteed drainage, no worries. Well, there could be a worry if the slab the installer was given is out of level 1/4” per foot in the opposite direction of the drain and this is not addressed. Due to field imperfections like this, there will always be the need for a trained craftsperson to do the install. 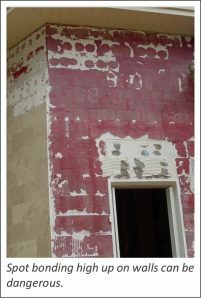 Skilled tile craftspeople have the necessary experience and knowledge, and know what to look for and how to deal with circumstances like this. Fin Pan, Inc., manufacturer of tile backer boards and PreFormed® ready-to-tile products, has recently introduced the ClearPath® Curbless Shower Pan System. ClearPath is an innovative way to construct a barrier-free shower pan that requires no structural modifications to the existing floor joists. It’s ideal for remodeling and new construction and affords homeowners near limitless design options. 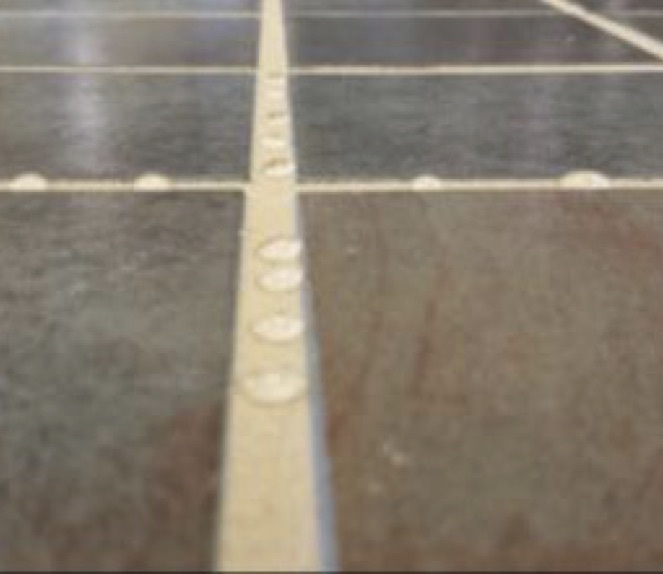 The foundation of ClearPath starts with the ClearPath Drain Plate and TI-ProBoard®. 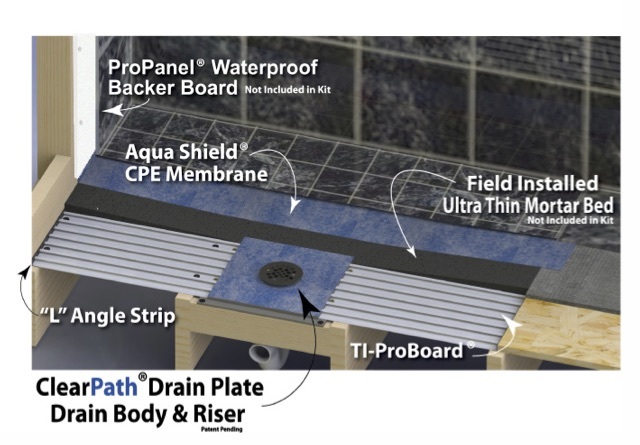 The drain plate comes with integrated drain assembly, waterproofing mat and is pre-pitched for proper sloping.TI-ProBoard is a composite structural underlayment that offers the ability to install ClearPath directly on top of the floor joists. 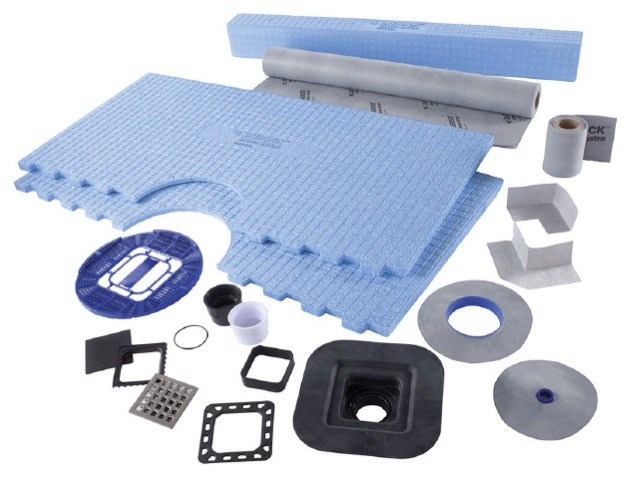 ClearPath is available in four shower kits and includes drain plate, TI-ProBoard, perimeter edge protector, fasteners and CP waterproofing membrane. When used in conjunction with Util-A-Crete® or ProTEC® Cement Backer Board or ProPanel® Lightweight Waterproof Backer Board, Fin Pan offers a Lifetime Limited Warranty. www.finpan.com. 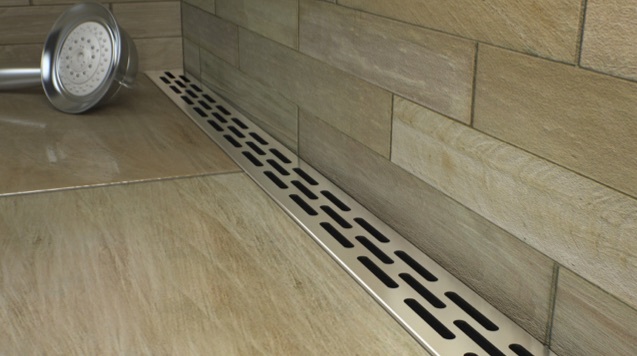 Noble Company offers the FreeStyle Linear Drain™, which provides a highly secure drain and waterproofing combination. 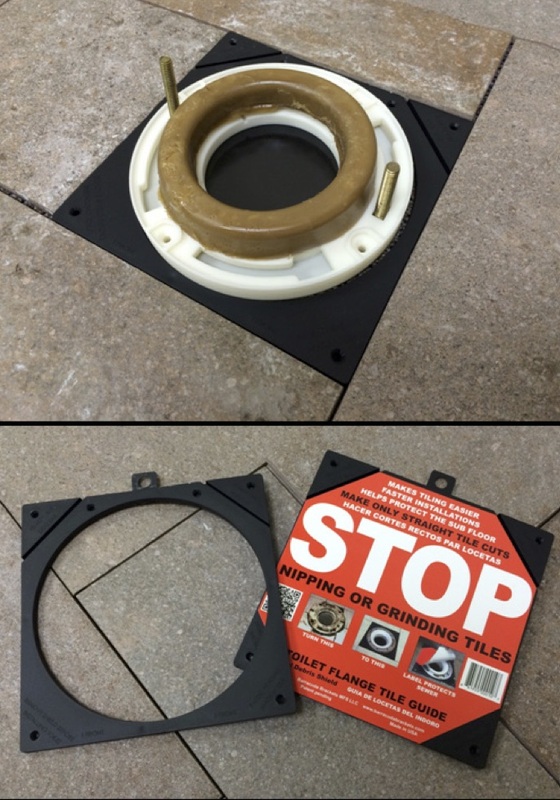 A clamping collar connects NobleSeal waterproofing membrane to the drain and the waste pipe is solvent-welded into the drain. FreeStyle Linear Drains have an internal slope making installation easier. There is no shimming or leveling required. 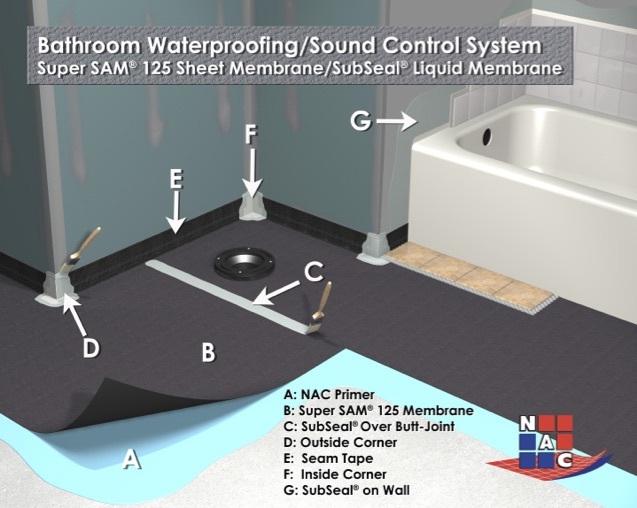 FreeStyle Linear Drains are listed for shower waterproofing by national plumbing code authorities. A low-profile and high drainage capacity (36 GPM) make FreeStyle ideal for barrier-free applications. Install FreeStyle at the wall, the exit, or wherever the design requires. Available in seven widths from 24” to 60” with brushed stainless or tile-top strainers. Quick Drain USA has introduced a brand new concept in the evolution of shower drains: the elegant WallDrain system that takes the idea of linear drains to a logical conclusion -– no drain in the shower floor at all! This allows sloping of the whole shower pan in one direction to eliminate any grates and covers to step on or clean. This simple idea is mostly used in wet rooms and curbless showers. The system has full height, depth and length adjustability built in for ease of installation and perfect look every time. Tuning or lippage-control systems are huge in this day and age, with the flood of large-format tiles and thin tiles on the market. The main issue with the large-format tile is bowing or warpage that occurs in the tile body as it is fired. Normally this warpage occurs in the center of the tile. We have the wood-like porcelain tiles going in everywhere, floors, walls, etc. Some are flat, most are not. The only way to combat this warping in the tile is to use a tuning system. Even if a floor is perfectly flat with mud, using warped tiles on the floor in an offset pattern will cause undesirable lippage. Normally, from what we have seen, many people have no clue what lippage is until they have it in their installation. So sometimes we incorporate this system into the installation whether the customer wants to pay for it or not. Using the Mechanical Lippage Tuning (MLT) system on my dime vs. tearing out the whole installation is sometimes the choice we have to make as installers. 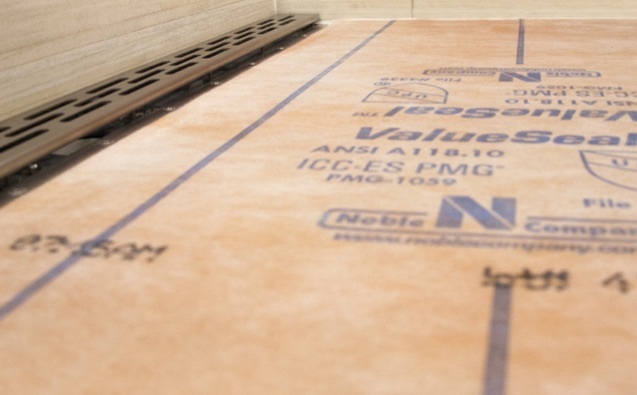 Large-format tiles in this industry have caused us installers a lot of headaches. The tuning systems are a tool you need to have in your arsenal to be successful in this industry. Mick Volponi was the man to see the need for such a system. 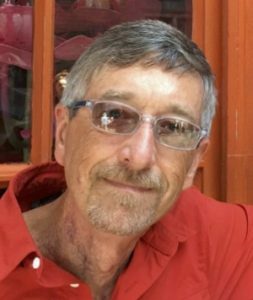 He invented the Tuscan Leveling System (TLS), which is now owned by Pearl Abrasives. While still part owner of the TLS, he went on to invent the MLT. The systems help tune the tiles at the joints – it’s a misconception to think they level them. Some systems use a gun to tighten and remove the straps and some use wedges. In all other aspects of tile installation, there are many choices. I had an installation recently where we put in 500 sq. ft. of 20” tile, 1/2” thick. Due to the settling of the floor, there was some lippage that was within industry standard. The problem was that the tile had a sharp edge and the customer kept dragging her bare feet across the joints. Plus the grout was not flush to the top of the joint, so the customer was not happy. We are in the business of making customers happy, so we tore out 80% of the installation down to the subfloor, and put in the same tile with the MLT. It eliminated the lippage and did not allow the tiles to sink. 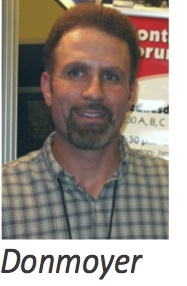 I think of Mick Volponi as a great innovator in the tile industry. As a tile setter he saw the need for such a product and even improved the one he invented. 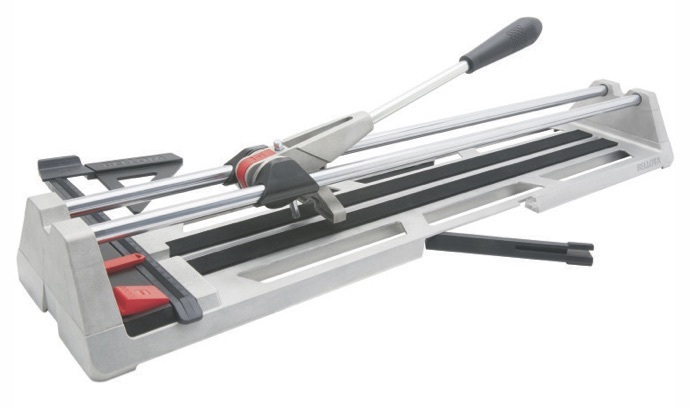 This tool makes it possible to install large-format tiles without lippage. Mechanical Lippage Tuning System is the industry’s newest, most innovative and economical tool to improve your tile installations. 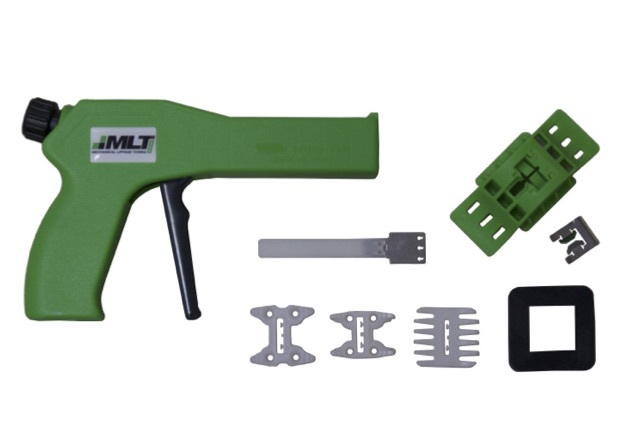 MLTS is a NO WASTE mechanical edge leveling system comprised of a reusable tensioning cap, a connecting strap with stainless steel insert and a material-specific bottom plate. MLTS aids the installer by “clamping” the tiles in place, allowing for near-perfect edge alignment. A key feature of the MLT System is that the cap can be easily disengaged, allowing the installer to have complete control. The system is fully compatible with thin porcelain tile, conventional thickness materials including porcelain and stone, as well as planks, slabs and ungauged tiles. MLT System will save time and eliminate costly callbacks for unsightly lippage. MLT System is endorsed by many well-respected manufacturers. http://www.midamericatile.com/products/tile-installation-maintenance.htm; view a demonstration at www.youtube.com/watch?v=20dvZqLxH1E. RTC Products offers the Hole Shot Dry Series Bits, the latest in dry-cut diamond technology. They are great for all types of hard material such as porcelain, quarry tile, slate, ceramic, marble, travertine and granite. 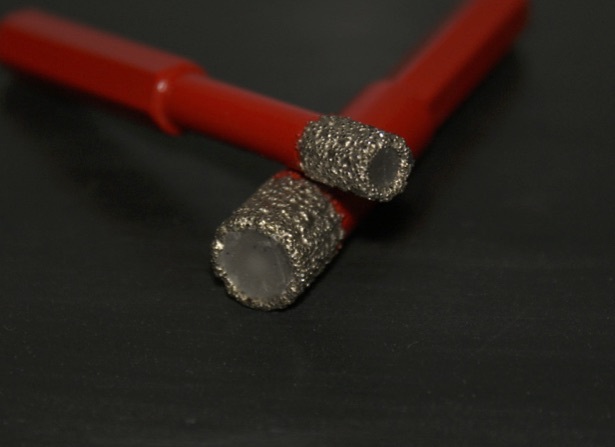 Tested to provide up to 30 holes per bit with no water, the vacuum-brazed diamond allows for dry cutting when water is limited or not an option. Bits should be used with a standard handheld drill (800-2500 RPM). As Curt Rapp, CEO of Tile Doctor said, “Grout. It’s not an afterthought anymore.“ Indeed, it is not, and it is rapidly becoming a high-fashion item designed to not simply fill joints, but to do it in style. Formulations include stain, crack and water-resistance, and some also include antimicrobials – all designed to keep joints looking pristine and beautiful for a long time. Traditional cement-based grout categories have expanded to include epoxies over the years. Today the big word in grout is “ready-to-use,” which offers many advances in terms of ease of use and application and the ability to save unused portions. When imbued with special particles, grout can take on a translucent or metallic look, transforming from a utilitarian product that comes in a range of colors to one that offers added design dimensions to the finished tile or stone installation. Peruse the following comments to stay ahead of the curve when it comes to grout and make grout selection easier for your next installation job. A grout revolution is here. Pre-mixed grouts are on the rise. 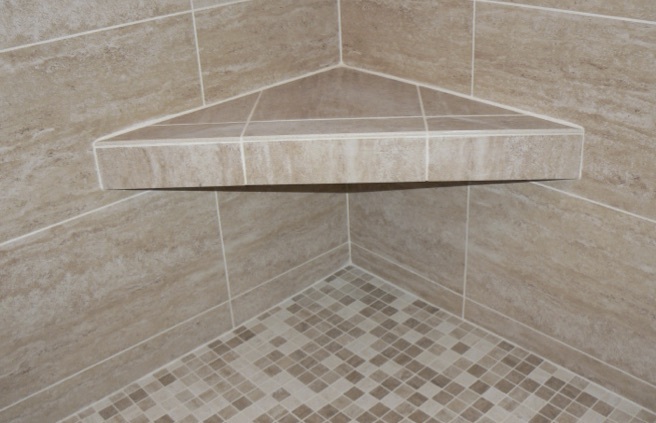 Many performance levels of pre-mixed grouts are now in the market; therefore it is critical to ensure you choose a grout to match your performance requirements and understand how to properly install it. The more premium the grout, the more it offers the key attributes associated with long-term durability: stain, crack and water resistance. Unlike cement grouts, most pre-mixed grouts are applied in a small area (arm’s length) and cleaned as you go. There is no more waiting for the grout to firm up before you clean. There are design choices to consider as well. Do you prefer the grout joint to look similar to a cement grout? Or would you prefer it to allow light to pass through the joint and into the tile itself, creating a three-dimensional appearance to complement any clear glass tile? Choosing a pre-mixed grout with a premium binder system can ensure it will offer a lifetime of pleasure. Stain-proof grouts continue to be a meaningful trend in today’s tile installations. The demand for these products is based on a fundamental market need. While designers and homeowners appreciate the dynamic array of tile sizes, shapes and colors available, they don’t like dirty grout joints. This is one factor behind the desire for larger-format tile and for smaller grout joints. 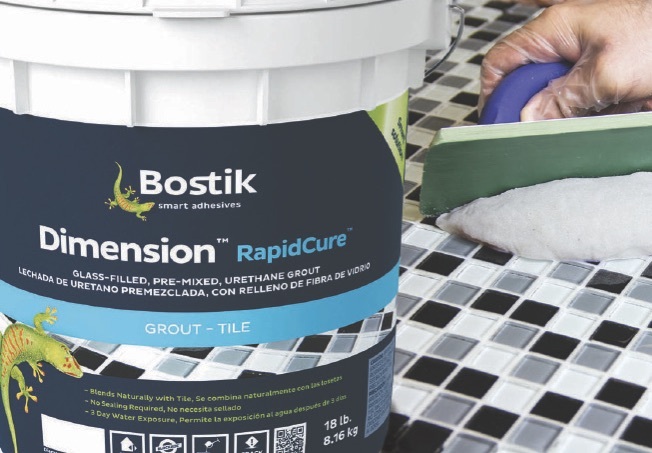 Epoxy-based grouts are one solution but tile installers prefer the ease of application of single-component grouts that are color consistent, efflorescence free, require no mixing and never need to be sealed. The movement in tile setting materials, specifically with grouts, is occurring on two fronts. 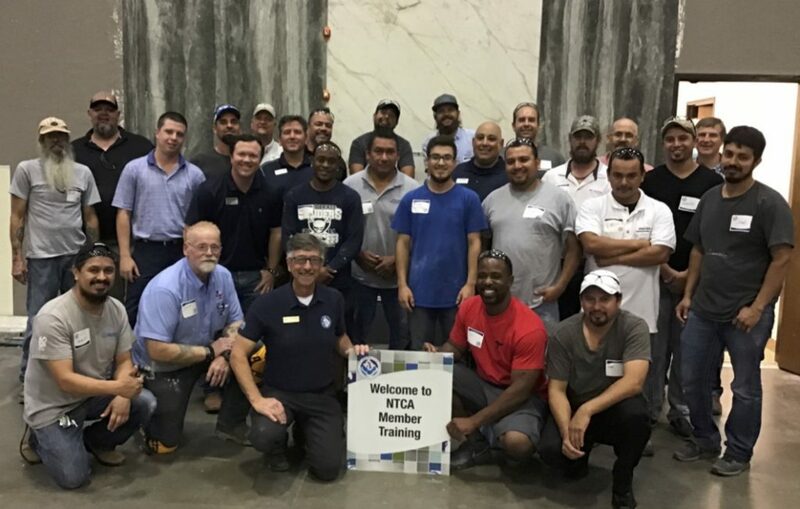 For portland cement powdered grouts, more installers are opting to upgrade their grout selection to a rapid setting, CAC-Calcium Aluminate Cement, which offers higher performance specifications and typically adheres to ANSI A 118.7. Traditional portland cement grouts typically only subscribe to ANSI A 118.6. Given the trend to larger-format tile and gap widths averages in the 3/8” range, less grout is being required per square foot. 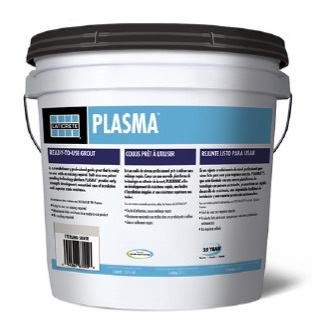 This allows the installer to justify the price point bump with the higher-performance grout. The other movement we are seeing in the industry is the use of RTU (ready-to-use) grouts moving out of the DIY arena and into the commercial contractor/installer playing field. What has driven this is the improvement in the overall performance in this grout category. The RTU grout chemistry includes acrylics, urethanes and hybrid versions. When cost is a consideration, and it always is, the product cost of RTU grouts vs. traditional cement grouts is higher. Yet, when you factor in the reduction in labor time for installation and the “no sealing” required advantage, RTU grouts are a bargain. Trending through customer requests and installer usage is the demand for synthetic grouts, commonly called “ready-mixed” grout. Although these types of products existed decades ago, the early versions were basically water-based adhesives with granular aggregate and colorant/pigment to simulate a textured grout. These early versions fell shy of full acceptance due to their overly “sticky” nature, difficulty of application and less-than-full performance equal to or better than cementitious grouts. With recent polymer science and enhanced industry formulary know-how, tile adhesive and grout manufacturers are able to produce a formulary synthetic ready-mix grout that addresses shortcomings of the earlier-version grouts. The shorter drying times, reduced joint shrinkage, and easier installation clean-up have been moved or adjusted to manageable, realistic and practical installation levels. Ready-mixed grout installations are not identical to cement grouts in drying and cure times; however, there are some excellent benefits added to today’s “ready-to-use” grouts that were not available in earlier versions and currently are not available in cementitious grout. Upon installation, benefits of synthetic grouts include a sealed or stain-resistant grout within the mix. More significant is the newer polymer-resin technology, which delivers an elastomeric or flexible characteristic that never existed in previous traditional grout versions. Its additional benefits include an identical-color or same-color match from a start-and-stop or interrupted/incompleted grout installation. This means newly-installed grout perfectly matches the color of grout installed previously in the job. Touch-up or repairs no longer look different since cement shading has been taken out of the formula. The final benefit is the factory mix; no longer is the grout dependent on too little or too much addition of water mixed in by the installer. The grout is ready to use upon opening the container. These types of grout allow resealing of the container and saving of the unused portion for another application. There has been some hesitation to embrace the newer version /synthetic version of ready-mixed grouts by some individuals and groups in our industry. But, I ask them to look upon their own trials, errors and acceptance and use of business technology for pagers, fax machines, cell phones and now smart phones. Would they would be willing to go back to the older technology? If I were to call the new grout “smart grout,” would you be more likely to realize the potential for this newer type of grout product? It’s not perfect and not without fault but moving forward for better tile and stone installations. Grout. It’s not an afterthought anymore. Today’s chemistries offer unlimited options: some proven, some very new. One thing for sure is that designers and specifiers appreciate options to assist in making their projects unique and help their design, and grout has for so long been that overlooked and underappreciated element in the design process. Now you can get grout that looks like metal or glass that refracts colors from the surrounding glass, sparkle metallic effects, highly chromatic colors and even make your grout glow in the dark. Grout now has color delivered without pigment so there is no shading or discoloration and color that is as durable as the tiles themselves. And grout can be a design option at last with it still being the least costly portion of the tile installation. With today’s performance options grout that used to be the weakest and most problematic part of the tile install now becomes the biggest no-brainer of all. Have you ever met a homeowner who loved their grout? Today it’s entirely possible to turn the tide on the grout issues once and for all. The latest and greatest in grouts I have seen is the colorant. You get a bag of white grout and you buy the colorant separately. Many manufacturers who make grout are coming out with it. Once one manufacturer makes it, they all have to in order to compete and competitive. What’s great about this type of grout is that you can stock the bag of base grout, and then on your trip to a distributor just pick up the small box of colorant. You don’t need to pick up the grout base every time. PERMACOLOR® Select by LATICRETE is the one I have used personally. This grout is considered rapid setting, so it is critical not to mix too much at one time or you will never get it in the joint before it hardens. Rapid-setting grouts are good because we can see the final color right away. With traditional grouts like sanded and unsanded grouts that need to be sealed, you won’t see the final result until it is dry. There also has been a landslide of new “premixed” grouts coming out on the market. These are considered one-step. They are ready to be used right out of the bucket. The advantage is no drill needed to mix the grout. I have personally tried many of the premixed grouts but JD Tile has decided to stick with either epoxies or fast-setting grout. I am a big user of LATICRETE SpectraLOCK® epoxy grout, and have been using it in showers for many years with 100% success rate. 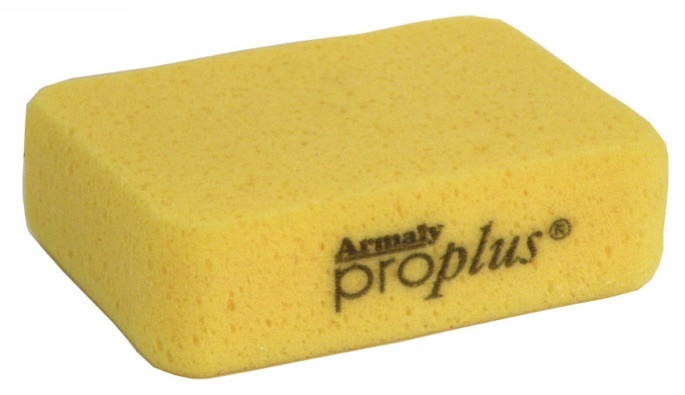 The premixed grouts just don’t measure up to epoxy in quality, and it seems everyone wants something quick. Doing a tile installation is not quick, so why should the grout be easy? One premixed I used was very sandy and very difficult to put in; the other was almost too easy but the clean-up process was a bear. I stopped back two months after this installation with the premixed and I could still see residue on the tile I had missed. Whatever is in these premixed grouts leaves a residue behind that normal grout does not. Sometimes the recommended cleaning solution to remove haze has a very strong smell and in the winter you can’t really open the windows. So overall, premixed grouts do have a market. We will stick with epoxy – there is not a better grout. We have mastered using it and are always willing to try new products, but they aren’t game changers for us. H.B. 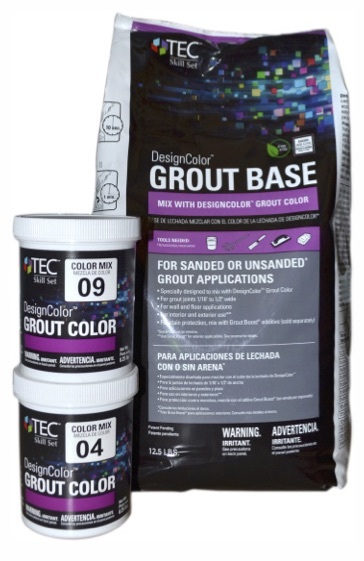 Fuller Construction Products offers new TEC® Skill Set™ DesignColor™ Grout, available at select Lowe’s. This revolutionary grout allows tile contractors to provide customers with more than 100 in-stock grout color choice options using 12.5-lb. bags of universal grout base paired with interchangeable and unique color mixes. This innovative approach reduces inventory and simplifies the process of finishing any residential or commercial tiling project. Users simply pair each 12.5-lb. plastic bag of DesignColor Grout universal grout base with two individually packaged color mix cups to create the grout color. Then, the grout components can be mixed with Grout Boost® grout additive – no measuring required – to create a stain proof grout. Contractors can buy the grout base bags in bulk and keep them on hand for multiple jobs, and then encourage individual clients to visit select Lowe’s to pick out their color mixes themselves. TEC Skill Set DesignColor Grout is a universal formula that can be used on both floors and walls, sanded and unsanded applications. It meets performance requirements of both residential and commercial environments. When mixed with Grout Boost, DesignColor Grout can be used in exterior applications and in wet areas, like showers and pools. www.hbfuller-cp.com. The biggest thing – literally – in our industry these days is large thin tiles. This technology is ramping up, and its possibilities are endless. 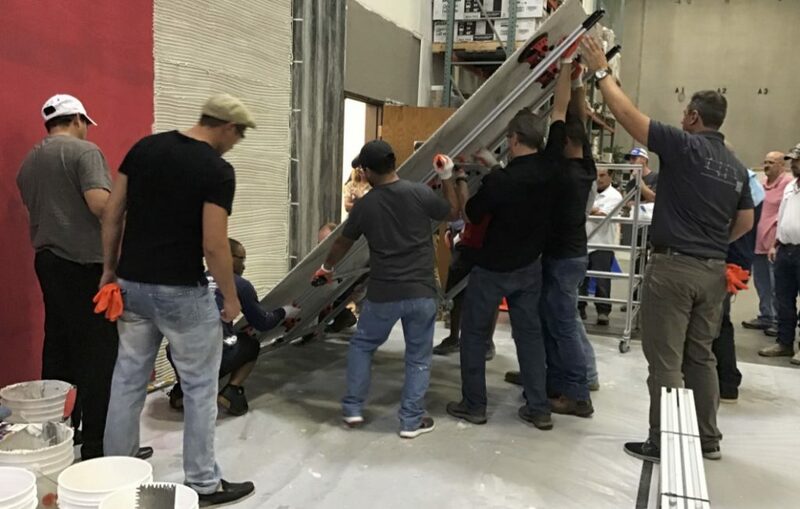 While they have been popular in Europe for several years, the North American tile industry has embraced the mounting popularity of very large, thin tile installations. Setting material manufacturers have had to develop mortars with advanced technologies such as long open time, great sag resistance, higher flexibility and longer pot life. The development of proper substrate preparation materials for walls and floors is also paramount for the success of very large and thin tile panels. 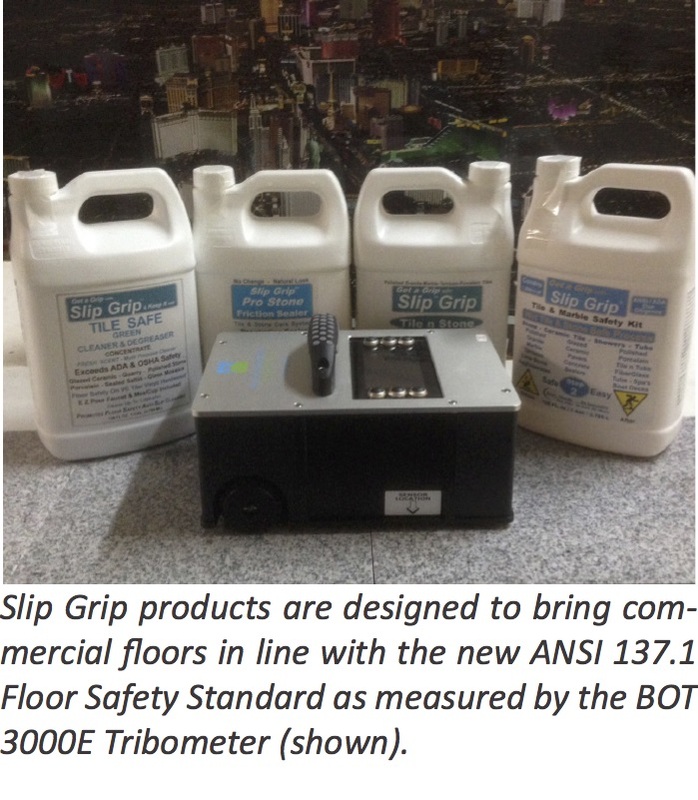 High-flow self-leveling products that produce supremely flat floors are a necessity for floor applications. Wall and floor smoothing and screeding mortars with rapid drying properties produce plumb, flat walls and level floors keeping installations on schedule. With the ever increasing size of field tile, traditional mortars simply won’t do. 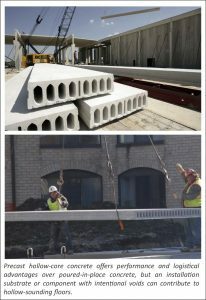 These large and heavy tiles require the use of a modified dry-set mortar that can support the increased weight. From wood-look planks to 15” or more tile options, a large format tile mortar must be selected to minimize lippage and maintain a smooth, level tile installation. Tile contractors, design professionals and end users should always discuss the available options and the aesthetic as well as the durability implications of mortar selection on the overall project. Maximum or 100% coverage is typically required for reduced-thickness porcelain tiles. A high-performance, latex-fortified portland cement thin-set or medium-bed mortar can be used. Using the appropriate specialty notched trowel along with proper troweling techniques and back-buttering will make achieving complete coverage easier. 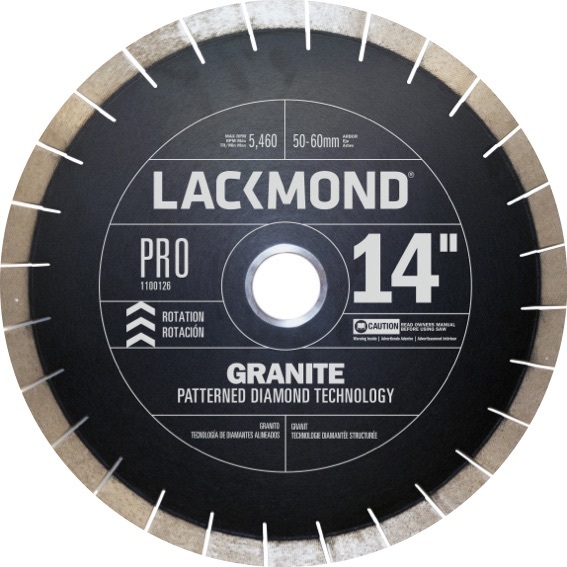 Mechanical edge-leveling systems can help to reduce lippage at the edges and corners. Finally, always remember to follow standard industry guidelines for movement joints. Thin tile and large thin porcelain tiles are trending in the tile and stone industry, resulting in technology innovation from leading installation manufacturers. 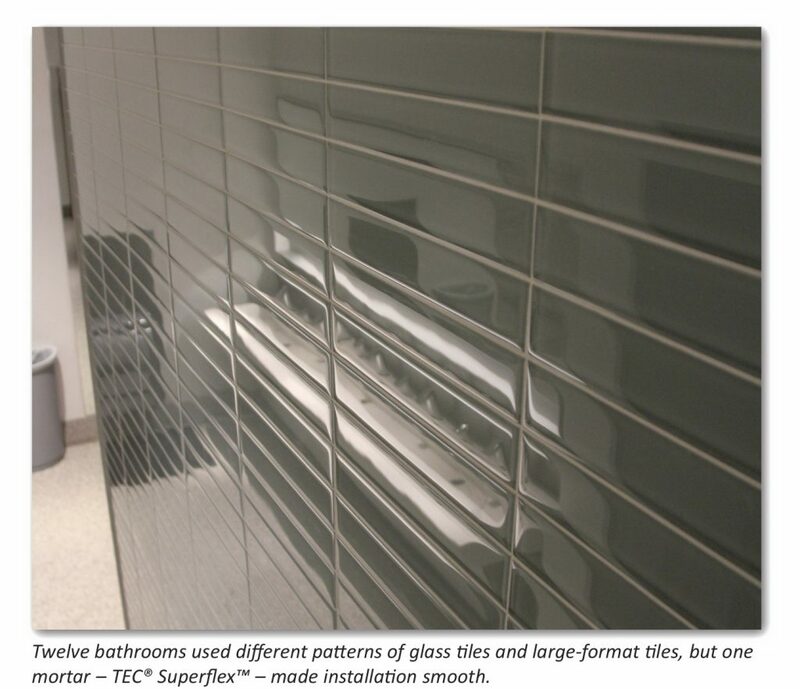 As the thin tile market grows with more manufacturers offering products and promoting to the market, there is a growing wave of designers, architects, distributors and contractors seeing an impact upon their business. 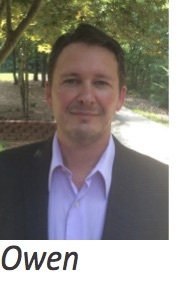 Now from an installation perspective the trend is significant – contractors are challenged to learn new methods, procedures and team-working concepts to run such jobs. 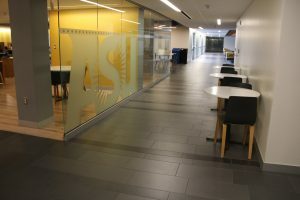 As more contractors and manufacturers have gained exposure to the thin tile business, additional challenges have been identified to improve productivity and save labor efforts when working with larger units, while improving installation products to address challenges unique to large thin porcelain tiles. Some of these challenges are the need for easier- to-spread mortars, mortars that provide better wet-out transfer properties, mortars with lower water demands, lighter-weight mortars, mortars with longer open or working times, and mortars with more flexibility . 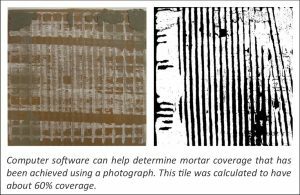 The increased selection of larger-format tile sizes greater than 15” tiles and larger will create a shift in bonding mortar selection to “large-and-heavy-tile” LHT mortars. The increase in dimensional length of these tiles as plank, larger-format and thin porcelain tiles requires more mortar depth underneath them and the substrate. 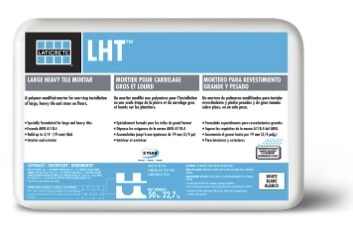 The LHT mortars (formerly referred as medium-bed mortars) have been formulated to withstand movement of heavier weighted tile while in the soft-paste state of installation. 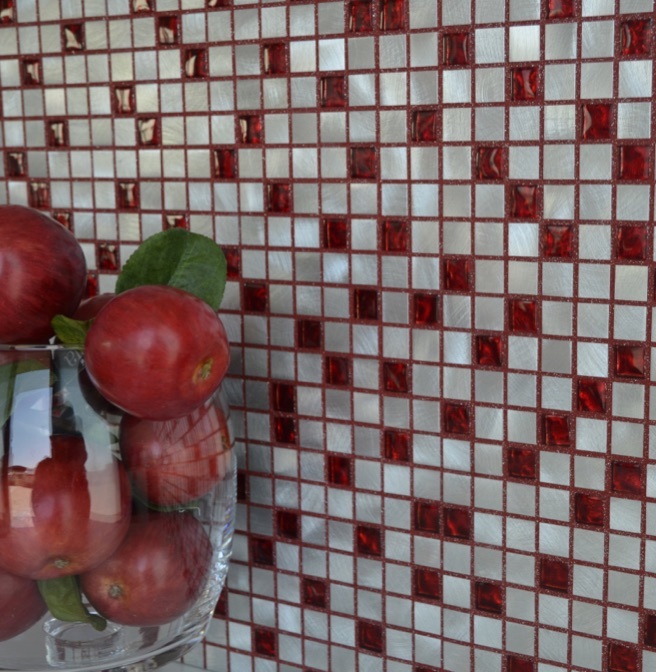 The products have an increased “grab” or surface tackiness for larger-format tiles. One of the most important characteristics of these mortars is shrinkage compensation that remains more volume true and resists shrinkage upon full hydration and cure. Lippage on horizontal application and non-sag movement of vertical application properties are available from the mortar manufacturers. As large tile (≥ 15” and/or plank tile) become requested, LHT mortars will be needed to properly set/bond these types of tiles. Although there is no direct ANSI Installation LHT mortars method to reference, the mortar manufacturers have had the foresight to have the product developed and bagged suitable for these installations. Other resources from the mortar manufacturers would include leveling/re-surfacer products to flatten the surface or re-direct slope with cementitious underlayments. Large and heavy tiles need to be installed with these types of LHT mortars. 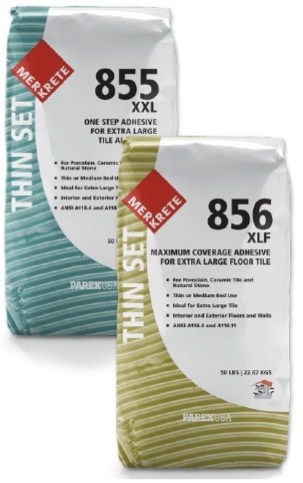 The emergence and popularity of porcelain tiles within recent history have spurred the development and use of latex-polymer “thinset” mortars. Our industry can now expect the selection and usage of LHT mortars to become a more common part of the installation resources that were once reserved for large commercial jobsites. Now, LHT mortars will become common for both commercial and residential use in the marketplace. I have toured thin tile plants, from the very first – even before the outside façade was finished on their building – to one of the newest lines just a few weeks back. We have seen many advancements in the thin tile manufacturing process and the products coming out of the lines. 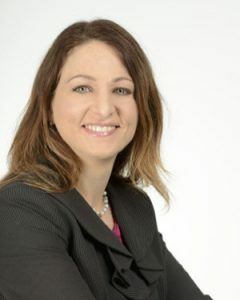 The rapid interest gaining traction really feels more like an explosion to me, and the possibilities are certainly staggering for us as an industry to grow our business. In the absence of a published standard anywhere in the world for the installation of these tiles, the questions also are as staggering as the opportunities. For certain, on a tile that can cost up to 5 to 6 times a traditional tile, the need for high-quality adhesives is a must, and this is the last place you should consider skimping. Adhesives should set up properly and bond well to large-unit porcelain tile slabs. We have so much at stake. The acceptance of this product in the market and using the proper installation products can set the destiny in motion for success or failure long-term. What we do not need is to have failures as we grow and discover the possibilities for this product’s use. Adhesives with the ability to set up under larger-format tiles without any requirement for drying – what we call Reaction Adhesives – bond with great strength and set up because of their chemistry regardless of temperature, humidity and many other factors that could be adverse to the installation and the jobsite conditions. 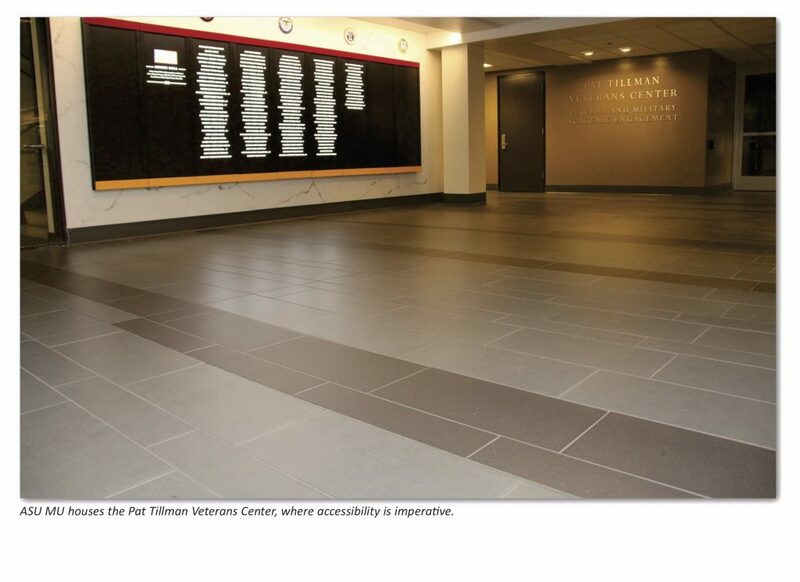 If you had a blank slate to write out what the optimal adhesive properties would be for all thin tile installations, you’d probably ask for the following: suitable for exterior and extreme conditions; non-sag; high bond strength; waterproof; chemical-resistant; some flexural properties; a predictable setting time; suitable for many, if not all, substrates; and one that provides an installation process that is predictable for installers. 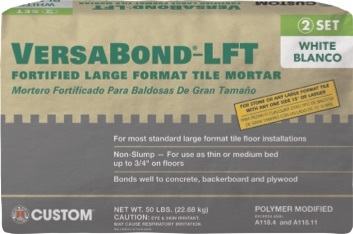 Custom Building Products has created VersaBond®-LFT for large-format tile as a complementary product to VersaBond, CUSTOM’s popular everyday thin-set mortar. VersaBond-LFT is designed for use in most standard large-format tile floor installations with porcelain, ceramic or natural stone 15” or greater on any side. 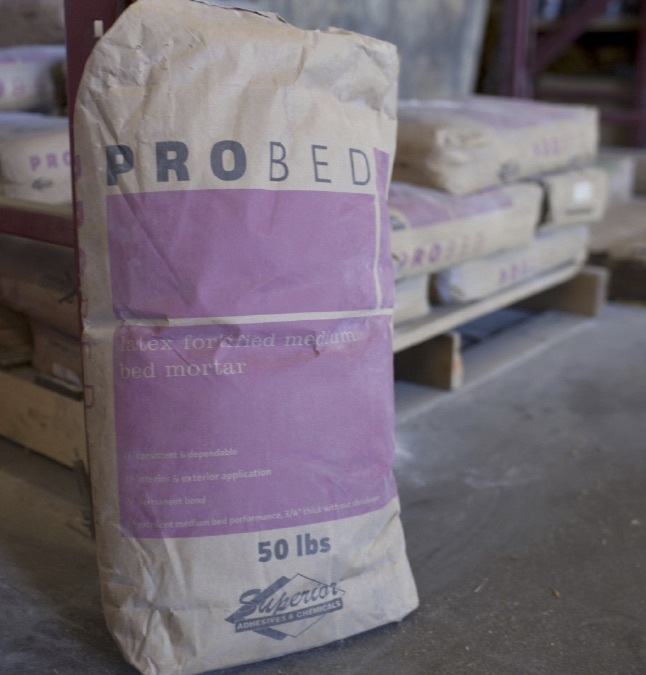 The product’s non-slump formula can be used as a thin-set or medium-bed (dry-set) mortar up to 3/4” on floors, and it bonds well to concrete, cement backerboards such as WonderBoard® Lite, as well as plywood. VersaBond-LFT, which meets the requirements of ANSI A118.4 and A118.11, is available in white and gray. 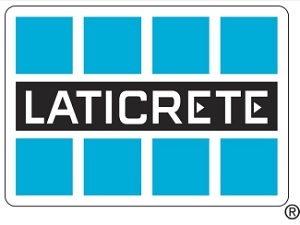 LATICRETE LHT™ is a polymer-modified large-and-heavy tile mortar specifically formulated to provide a one-step installation for large-format ceramic tile, porcelain tile, marble and stone on floors. LHT features excellent adhesion with a superior bond that meets the demands of challenging installations involving large and/or heavy tile. LHT offers multiple utility with excellent medium bed/large heavy tile performance, and can be applied 3/4” (19 mm) thick without shrinkage. The smooth and creamy consistency of this easy-to-trowel mortar assures proper coverage on both the substrate and the tile or stone. Perfect for interior and exterior floor installations, LHT meets or exceeds the ANSI A118.1 and ANSI A118.4 standards. 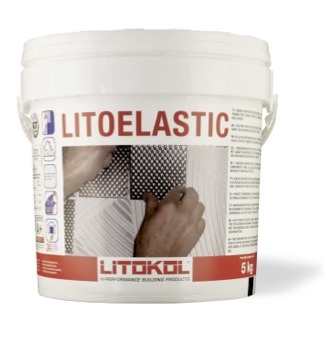 Available in grey and white, LHT is suitable for use over many substrates. www.laticrete.com.